From Genesis to Revelation, the scarlet thread is woven through every book of the Bible. This Richard Booker classic provides a new way to unravel the complexities of the Bible to give us a better overview of God's perfect planning. 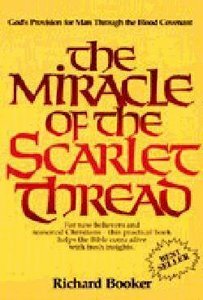 About "The Miracle of the Scarlet Thread"
Richard Booker (Ph.D., International Seminary) is the President of Sounds of the Trumpet ministries and the Founder of the Institute for Hebraic-Christian Studies. He is the author of the best selling book The Miracle of the Scarlet Thread and has authored over twenty books dealing with the Hebraic heritage of Christianity and the victorious Christian life including Radical Islam's War Against Israel, Christianity and the West; Living In His Presence; Come And Dine: A simple Plan for Effective Bible Study and most recently Celebrating Jesus in the Biblical Feasts.